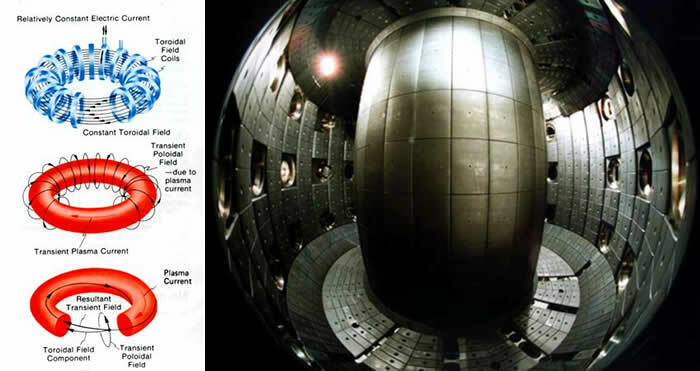 Research into controlled fusion, with the aim of producing fusion power for the production of electricity, has been conducted for over 60 years. It has been accompanied by extreme scientific and technological difficulties, but has resulted in progress. At present, controlled fusion reactions have been unable to produce break-even (self-sustaining) controlled fusion reactions. Workable designs for a reactor that theoretically will deliver ten times more fusion energy than the amount needed to heat up plasma to required temperatures (see ITER) were originally scheduled to be operational in 2018, however this has been delayed and a new date has not been stated. Nuclear fusion is the process by which two or more atomic nuclei join together, or "fuse", to form a single heavier nucleus. During this process, matter is not conserved because some of the mass of the fusing nuclei is converted to energy which is released. The binding energy of the resulting nucleus is greater than the binding energy of each of the nuclei that fused to produce it. Fusion is the process that powers active stars. There are many experiments examining the possibility of fusion power for electrical generation. Nuclear fusion has great potential as a sustainable energy source. This is due to the abundance of hydrogen on the planet and the inert nature of helium (the nucleus which would result from the nuclear fusion of hydrogen atoms). Unfortunately, a controlled nuclear fusion reaction has not yet been achieved, due to the temperatures required to sustain one. Some fusion techniques can be employed in the design of atomic weaponry and although more generally, it is fission and not fusion, that is associated with the making of the atomic bomb. It is worth noting that fusion can also have a role to play in the design of the hydrogen bomb. The fusion of two nuclei with lower masses than iron (which, along with nickel, has the largest binding energy per nucleon) generally releases energy, while the fusion of nuclei heavier than iron absorbs energy. The opposite is true for the reverse process, nuclear fission. This means that fusion generally occurs for lighter elements only, and likewise, that fission normally occurs only for heavier elements. There are extreme astrophysical events that can lead to short periods of fusion with heavier nuclei. This is the process that gives rise to nucleosynthesis, the creation of the heavy elements during events such as supernovae. Creating the required conditions for fusion on Earth is very difficult, to the point that it has not been accomplished at any scale for protium, the common light isotope of hydrogen that undergoes natural fusion in stars. In nuclear weapons, some of the energy released by an atomic bomb (fission bomb) is used for compressing and heating a fusion fuel containing heavier isotopes of hydrogen, and also sometimes lithium, to the point of "ignition". At this point, the energy released in the fusion reactions is enough to briefly maintain the reaction. 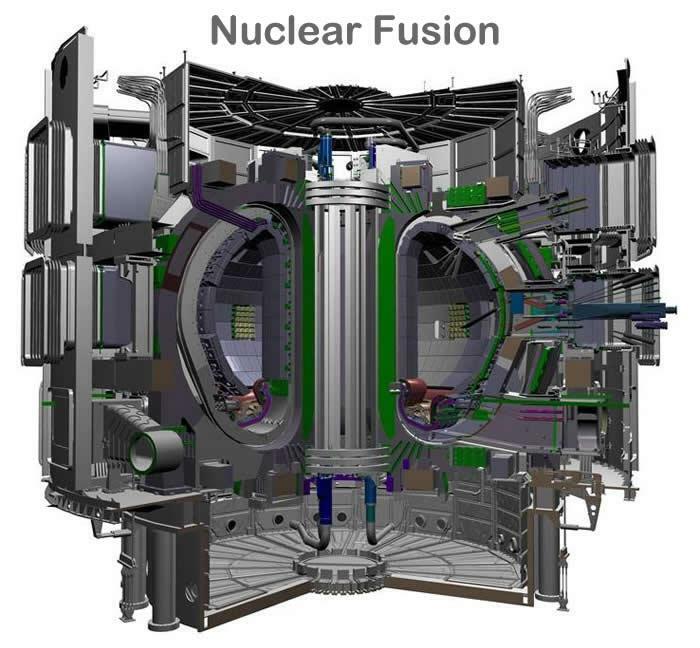 Fusion-based nuclear power experiments attempt to create similar conditions using far lesser means, although to date these experiments have failed to maintain conditions needed for ignition long enough for fusion to be a viable commercial power source. Building upon the nuclear transmutation experiments by Ernest Rutherford, carried out several years earlier, the laboratory fusion of heavy hydrogen isotopes was first accomplished by Mark Oliphant in 1932. During the remainder of that decade the steps of the main cycle of nuclear fusion in stars were worked out by Hans Bethe. 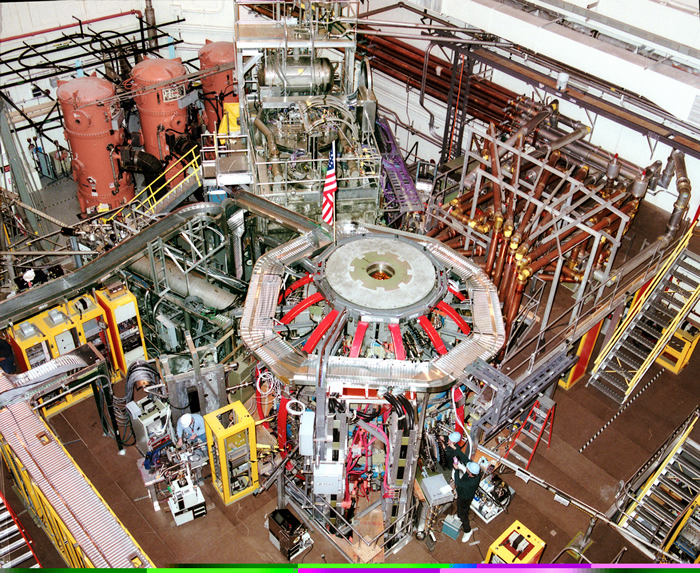 Research into fusion for military purposes began in the early 1940s as part of the Manhattan Project, but this was not accomplished until 1951 (see the Greenhouse Item nuclear test), and nuclear fusion on a large scale in an explosion was first carried out on November 1, 1952, in the Ivy Mike hydrogen bomb test. Research into developing controlled thermonuclear fusion for civil purposes also began in earnest in the 1950s, and it continues to this day. Two projects, the National Ignition Facility and ITER are in the process of reaching breakeven after 60 years of design improvements developed from previous experiments. 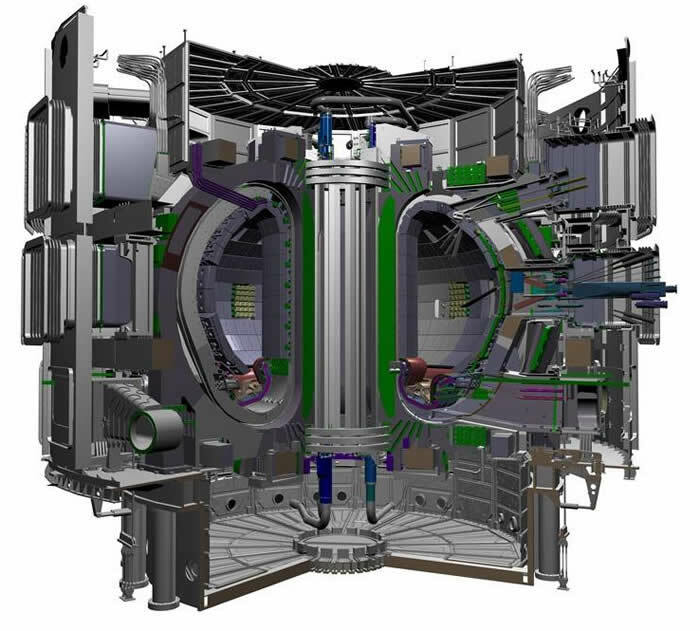 The best results were obtained with the Tokamak-type installations (see the Figure below). ITER is based on the 'tokamak' concept of magnetic confinement, in which the plasma is contained in a doughnut-shaped vacuum vessel. The fuel—a mixture of deuterium and tritium, two isotopes of hydrogen—is heated to temperatures in excess of 150 million°C, forming a hot plasma. Strong magnetic fields are used to keep the plasma away from the walls; these are produced by superconducting coils surrounding the vessel, and by an electrical current driven through the plasma. The origin of the energy released in fusion of light elements is due to an interplay of two opposing forces, the nuclear force which draws together protons and neutrons, and the Coulomb force which causes protons to repel each other. The protons are positively charged and repel each other but they nonetheless stick together, portraying the existence of another force referred to as a nuclear attraction. The strong nuclear force, that overcomes electric repulsion in a very close range. The effect of this force is not observed outside the nucleus. Hence the force has a strong dependence on distance making it a short range force. The same force also pulls the neutrons together, or neutrons and protons together. Because the nuclear force is stronger than the Coulomb force for atomic nuclei smaller than iron and nickel, building up these nuclei from lighter nuclei by fusion releases the extra energy from the net attraction of these particles. For larger nuclei, however, no energy is released, since the nuclear force is short-range and cannot continue to act across still larger atomic nuclei. Thus, energy is no longer released when such nuclei are made by fusion (instead, energy is absorbed in such processes). Fusion reactions of light elements power the stars and produce virtually all elements in a process called nucleosynthesis. The fusion of lighter elements in stars releases energy (and the mass that always accompanies it). For example, in the fusion of two hydrogen nuclei to form helium, seven-tenths of 1 percent of the mass is carried away from the system in the form of kinetic energy or other forms of energy (such as electromagnetic radiation). However, the production of elements heavier than iron absorbs energy. It takes considerable energy to force nuclei to fuse, even those of the lightest element, hydrogen. This is because all nuclei have a positive charge (due to their protons), and as like charges repel, nuclei strongly resist being put too close together. Accelerated to high speeds (that is, heated to thermonuclear temperatures), they can overcome this electrostatic repulsion and get close enough for the attractive nuclear force to be sufficiently strong to achieve fusion. The fusion of lighter nuclei, which creates a heavier nucleus and often a free neutron or proton, generally releases more energy than it takes to force the nuclei together; this is an exothermic process that can produce self-sustaining reactions. The US National Ignition Facility, which uses laser-driven inertial confinement fusion, is thought to be capable of break-even fusion. Energy released in most nuclear reactions is much larger than in chemical reactions, because the binding energy that holds a nucleus together is far greater than the energy that holds electrons to a nucleus. For example, the ionization energy gained by adding an electron to a hydrogen nucleus is 13.6 eV—less than one-millionth of the 17 MeV released in the deuterium–tritium (D–T) reaction shown in the diagram to the right. Fusion reactions have an energy density many times greater than nuclear fission; the reactions produce far greater energies per unit of mass even though individual fission reactions are generally much more energetic than individual fusion ones, which are themselves millions of times more energetic than chemical reactions. Only direct conversion of mass into energy, such as that caused by the annihilation collision of matter and antimatter, is more energetic per unit of mass than nuclear fusion. A substantial energy barrier of electrostatic forces must be overcome before fusion can occur. At large distances two naked nuclei repel one another because of the repulsive electrostatic force between their positively charged protons. If two nuclei can be brought close enough together, however, the electrostatic repulsion can be overcome by the attractive nuclear force, which is stronger at close distances. When a nucleon such as a proton or neutron is added to a nucleus, the nuclear force attracts it to other nucleons, but primarily to its immediate neighbours due to the short range of the force. The nucleons in the interior of a nucleus have more neighboring nucleons than those on the surface. Since smaller nuclei have a larger surface area-to-volume ratio, the binding energy per nucleon due to the nuclear force generally increases with the size of the nucleus but approaches a limiting value corresponding to that of a nucleus with a diameter of about four nucleons. It is important to keep in mind that the above picture is a toy model because nucleons are quantum objects, and so, for example, since two neutrons in a nucleus are identical to each other, distinguishing one from the other, such as which one is in the interior and which is on the surface, is in fact meaningless, and the inclusion of quantum mechanics is necessary for proper calculations. With the help of powerful lasers one can create a dense and highly ionized plasma. We need a highly ionized dense plasma to achieve nuclear fusion (cold or hot). Since 1989, it talks about achieving nuclear fusion hot and cold. Another two decades have passed and humanity still does not benefit from nuclear fusion energy. What actually happens? Is it an unattainable myth? It was also circulated by the media that has been achieved nuclear fusion heat. Since 1989 there are all sorts of scientists with all kinds of crafted devices, which declare that they can produce nuclear power obtained by cold fusion (using cold plasma). May be that these devices works, but their yield is probably too small, or at an enlarged scale these give not the expected results. This is the real reason why we can't use yet the survival fuel (the deuterium). Unfortunately today the dominant processes that produce energy are combustion (reaction) chemical combination of carbon with oxygen. Thermal energy released from such reactions is conventionally valued at about 7000 calories per gram. Only the early 20th century physicists have succeeded in producing, other energy than by traditional methods. Energy release per unit mass was enormous compared with that obtained by conventional procedures. The Kilowatt based on nuclear fission of uranium nuclei has today a significant share in global energy balance. Unfortunately, the nuclear power plants burn the fuel uranium, already considered conventional and on extinct. The current nuclear power is considered a transition way, to the energy thermonuclear, based on fusion of light nuclei. The main particularity of synthesis reaction (fusion) is the high prevalence of the used fuel (primary), deuterium. It can be obtained relatively simply from ordinary water. Deuterium was extracted from water for the first time by Harold Urey in 1931. Even at that time, small linear electrostatic accelerators, have indicated that D-D reaction (fusion of two deuterium nuclei) is exothermic. Today we know that not only the first isotope of hydrogen (deuterium) produces fusion energy, but and the second (heavy) isotope of hydrogen (tritium) can produce energy by nuclear fusion. The first reaction is possible between two nuclei of deuterium, from which can be obtained, either a tritium nucleus plus a proton and energy, or an isotope of helium with a neutron and energy. Observations: a deuterium nucleus has a proton and a neutron; a tritium nucleus has a proton and two neutrons. Fusion can occur between a nucleus of deuterium and one of tritium. Another fusion reaction can be produced between a nucleus of deuterium and an isotope of helium. For these reactions to occur, should that the deuterium nuclei have enough kinetic energy to overcome the electrostatic forces of rejection due to the positive tasks of protons in the nuclei. For deuterium, for average kinetic energy are required tens of keV. For 1 keV are needed about 10 million degrees temperature. For this reason hot fusion requires a temperature of hundreds of millions of degrees. The huge temperature is done with high power lasers acting hot plasma. Electromagnetic fields are arranged so that it can maintain hot plasma. The best results were obtained with the Tokamak-type installations. Deuterium fuel is delivered in heavy water, D2O. Tritium is obtained in the laboratory by the following reaction. Lithium, the third element in Mendeleev's table, is found in nature in sufficient quantities. The accelerated neutrons which produce the last presented reaction with lithium, appear from the second and the third presented reaction. Raw materials for fusion are deuterium and lithium. All fusion reactions shown produce finally energy and He. He is a (gas) inert element. Because of this, fusion reaction is clean, and far superior to nuclear fission. Hot fusion works with very high temperatures. In cold fusion, it must accelerate the deuterium nucleus, in linear or circular accelerators. Final energy of accelerated deuterium nuclei should be well calibrated for a positive final yield of fusion reactions (more mergers, than fission). Electromagnetic fields which maintain the plasma (cold and especially the warm), should be and constrictors (especially at cold fusion), for to press, and more close together the nuclei. The potential energy with that two protons reject each other, be calculated with the following relationship. At a keV is necessary a temperature of 10 million 0C. At 360 keV is necessary a temperature of 3600 million 0C. In hot fusion it need a temperature of 3600 million degrees. Without a minimum of 3000 million degrees we can't make the hot fusion reaction, to obtain the nuclear power. Today we have just 150 million degrees made. To replace the lack of necessary temperature, it uses various tricks. In cold fusion one must accelerate the deuterium nuclei at an energy of 360 [keV], and then collide them with the cold fusion fuel (heavy water and lithium). Because obtaining the necessary huge temperature for hot fusion is still difficult, it is time to focus us on cold nuclear fusion. We need to bomb the fuel with accelerated deuterium nuclei. The fuel will be made ​​from heavy water and lithium. The optimal proportion of lithium will be tested. It would be preferable to keep fuel in the plasma state. ^ "Progress in Fusion". ITER. Retrieved 2010-02-15. ^ "The National Ignition Facility: Ushering in a New Age for Science". National Ignition Facility. Retrieved 2009-09-13. ^ The Most Tightly Bound Nuclei. Hyperphysics.phy-astr.gsu.edu. Retrieved on 2011-08-17. ^ Zhang, Fan; Murray, Stephen Burke; Higgins, Andrew (2005) "Super compressed detonation method and device to effect such detonation[dead link]"
^ D.Sagie and I.I. Glass (1982) "Explosive-driven hemispherical implosions for generating fusion plasmas"
^ T. Saito, A. K. Kudian and I. I. Glass "Temperature Measurements Of An Implosion Focus"
^ S.E. Jones (1986). "Muon-Catalysed Fusion Revisited". Nature 321 (6066): 127–133. Bibcode 1986Natur.321..127J. DOI:10.1038/321127a0. ^ Access: Desktop fusion is back on the table: Nature News. Nature.com. Retrieved on 2011-08-17. ^ Supplementary methods for “Observation of nuclear fusion driven by a pyroelectric crystal”. Main article Naranjo, B.; Gimzewski, J.K.; Putterman, S. (2005). "Observation of nuclear fusion driven by a pyroelectric crystal". Nature 434 (7037): 1115–1117. Bibcode 2005Natur.434.1115N. DOI:10.1038/nature03575. PMID 15858570. ^ UCLA Crystal Fusion. Rodan.physics.ucla.edu. Retrieved on 2011-08-17. This article does not have any comments. Be the first to leave a comment below. Nihil sine DeoFlorian Ion PETRESCUSenior Lecturer Dr. Eng. at Bucharest Polytechnic University.Doctoral Thesis: „Theoretical and Applied Contributions About the Dynamic of Planar Mechanisms with Superior Joints”.Expert in Industrial Design, Engines Design, Mechanical Transmissions, Dynamics, Vibrations, Mechanisms Machines Robots and Mechatronics. € 59 00 *inkl. MwSt. The movement of an electron around the atomic nucleus has today a great importance in many engineering fields. Electronics, aeronautics, micro and nanotechnology, electrical engineering, optics, lasers, nuclear power, computing, equipment and automation, telecommunications, genetic engineering, bioengineering, special processing, modern welding, robotics, energy and electromagnetic wave field is today only a few of the many applications of electronic engineering. The first chapter presents shortly a new and original relation which calculates the radius with that the electron is running around the atomic nucleus. With the help of powerful lasers one can create a dense and highly ionized plasma. We need a highly ionized dense plasma to achieve nuclear fusion (cold or hot). The second chapter presents, shortly, a new and original relation (20) which calculates the Doppler Effect exactly. The third chapter comes to proposing possible new energy sources, like energies obtained by the annihilation of a particle with its antiparticle. Speaking about a new ionic engine means to speak about a new aircraft (see the chapter 4). Should start some spatial projects, to capture energy (chp. 5). Es wurden noch keine Leserstimmen eingegeben.